Samsung confirmed during its Galaxy Note 8 event yesterday that it’s going to launch a new Gear smartwatch at IFA 2017 in Berlin next week. The company has provided no further details about the new wearable device as yet. Over the past few weeks, it has consistently been rumored that Samsung is working on a new wearable device. The Gear Sport bears model number SM-R600. It received its Wi-Fi certification earlier this month and was later spotted at the FCC as well. The certification documents have revealed that the Gear Sport is going to be powered by Tizen 3.0. It’s going to be the first wearable device from Samsung to be powered by the Tizen 3.0 platform out of the box. They’ve also revealed that the Gear Sport supports Wi-Fi and Wi-Fi Direct for data transfer. The Gear Sport’s features and specifications haven’t surfaced online as yet. We won’t have to wait too long to find that out as IFA 2017 is just around the corner. Samsung will confirm all of the details about this device officially in Berlin. 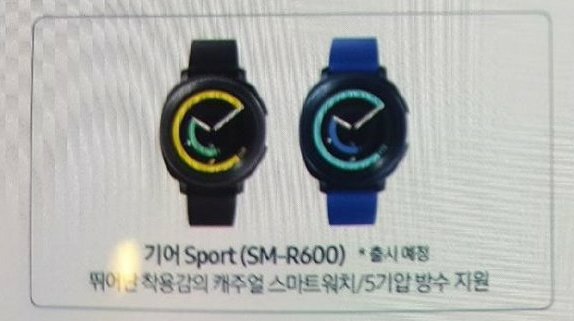 The image that has leaked online today suggests that it’s going to retain the circular design that has made Samsung smartwatches popular. The watchband itself appears to be small so it may not appeal to everybody. We’ll update you once more information about the Gear Sport is available. Looks like Gear S2 extended. Definitely looks like a lightweight version of Gear S2 with some updates. It doesn’t look like it will be an S4. Probably won’t see that until 2018. Gear S3 supports Wi-Fi direct. I’ve only seen it activate when there is a firmware update. looks like the gear S2 sport…?